Why Are We Supporting Guys Who Want to Blow Us Up? We knew that the Syrian rebels are mainly Al Qaeda, and that the U.S. has been supporting these terrorists for years. But even we were shocked to learn that the head of the Syrian rebels is also the global boss of Al Qaeda … and that he is calling for fresh terrorist attacks on America. Al Qaeda chief Ayman al-Zawahri called has called on Muslims to continue attacking Americans on their own soil in order to “bleed” the U.S. economy. “To keep up the hemorrhage in America’s security and military spending, we need to keep the Unites States on a constant state of alert about where and when the next strike will blow,” Zawahiri said. Reuters noted in February 2012 that al-Zawahri is backing the Syrian rebels, and asking his followers to fight the Syrian government. But al-Zawahri has since taken control of the main Al Qaeda rebel terrorist group in Syria: al-Nusra. A recent illustration of the fractured nature of the al-Qaeda network was provided during the spring of 2013 when Zawahiri [the global head of Al Qaeda] personally intervened to settle a dispute between Jabhat al-Nusra and al-Qaeda in Iraq (AQI). Zawahiri rejected AQI’s assertion of control over al-Nusra and declared the Syrian group to be under his direction. acknowledged as the most effective fighting force in the war against Bashar al-Assad’s regime. Let’s put this in context. Most of the Syrian “rebels” are Al Qaeda. The U.S. government has designated these guys as terrorists. Things are getting better, not worse: Al Qaeda is gaining more and more power among the rebels. And the U.S., Saudi Arabia, Qatar and Israel have been backing these guys for years. Indeed, we’ve long known that most of the weapons we’re shipping to Syria are ending up in the hands of Al Qaeda. And they apparently have chemical weapons. We’re arming the same guys who are threatening to blow us up. CAIRO – The brother of al Qaeda leader Ayman al-Zawahri has been arrested by police in Egypt, security sources said Saturday. Mohammed al-Zawahri, the younger brother of the terror network leader, was detained at a checkpoint in the Cairo suburb of Giza, the sources said. He has been a vocal supporter of ousted President Mohammed Morsi, Morsi’s Muslim Brotherhood movement and the more extreme group to which he belongs, Al Gama’a Al Islamiya. The arrest of the younger al-Zawahri came as more than 1,000 Brotherhood supporters and others opposed to the military’s overthrow of Islamist Morsi were detained Friday as mass protests turned violent. An Egyptian government official said Saturday that 173 people had died and more than 1,000 had been wounded in the clashes. The violence continued Saturday with an outbreak of gunfire near the al-Fath mosque in Cairo where a group of protesters had barricaded themselves inside. “Afghans affiliated to the al-Qaeda constitute over 65% of the Jihadi Salafi groups in (the Syrian province of) Deir Ezzor and they have come to Syria from Iraq,” the military source told FNA on the condition of anonymity. “The Syrian army’s intelligence displays that these Jihadi Salafis have been trained by the terrorist al-Qaeda organization and have infiltrated into Syria through Iraq after passing some necessary training courses,” the source added. Reports had also earlier revealed that Turkey’s national air carrier, Turkish Air, has been transiting Al-Qaeda and Taliban militants from North Waziristan in Pakistan to the Turkish borders with Syria. “The Turkish intelligence agency sent 93 Al-Qaeda and Taliban terrorists from Waziristan to Hatay province near the border with Syria on a Turkish Air Airbus flight No. 709 on September 10, 2012 and via the Karachi-Istanbul flight route,” the source told FNA in September, adding that the flight had a short stop in Istanbul. “A new Al-Qaeda has been created in the region through the financial and logistical backup of Turkey, Saudi Arabia, Qatar and a number of western states, specially the US,” a source told FNA in September. “Thus, the US, Britain and Turkey are looking at the Al-Qaeda as a tactical instrument,” he said, and warned of the regional and global repercussions of the US and Turkish aid to the Al-Qaeda and Salafi groups. “Unfortunately, these group of countries have just focused on the short-term benefits that the Salafis and the Al-Qaeda can provide for them and ignore the perils of this support in the long run,” he said. “At present, the western countries, specially Britain which hosts and controls the Jihadi Salafi groups throughout the world are paving the ground for these extremists to leave their homes – mostly in Qatar, Saudi Arabia, Kuwait and the Untied Arab Emirates (UAE) as well as those who live in Europe and the US – for Waziristan,” the source added. One of the most disgusting individuals in the United States government is the Republican Senator from Arizona named John McCain. For years following the staged attacks of September 11th, 2001 McCain has constantly reminded us about the so-called threat of Al-Qaeda. He has blindly repeated the ridiculous conspiracy theory that 19 Muslim hijackers with box cutters were solely responsible for those attacks. In reality Al-Qaeda was created by the CIA back in the 1980s and has primarily been used as a propaganda tool to justify wars in the Middle East. It is nothing more than a manufactured terror threat. Despite all of this, McCain who has warned us about the Al-Qaeda threat for over a decade recently decided to visit the Free Syrian Army a group currently attempting to overthrow the Syrian government. This militant group has been connected to or are actively a part of organizations that are under the umbrella of Al-Qaeda. In fact there have been numerous reports of how a large number of Free Syrian Army fighters have ties to or have defected to Jabhat al-Nusra an Islamist group widely identified as an Al-Qaeda linked organization. So here we have McCain associating with the Free Syrian Army a group that is confirmed to have had or currently have Al-Qaeda linked terrorists within its ranks. It is comical that the corporate media is allowing McCain to get away with this hypocrisy. It is especially ridiculous considering that there are people in Guantanamo Bay who have been held in prison without any due process or trial for basically doing the same thing McCain just did. If McCain wants to openly associate with terrorist groups than why isn’t he being treated as a terrorist sympathizer? It just shows the insanity behind the so-called war on terrorism and how phony it is. Apparently it is OK to associate with a terrorist group if it is a terrorist group that the U.S. government is currently in favor of supporting. Instead of being called a terrorist group by the U.S. government and the mainstream press, they call the Free Syrian Army a group of freedom fighters or rebels in order to give the organization an illusion of legitimacy. It doesn’t matter that the Free Syrian Army and its various proxy groups have been involved in a number of war crimes and other atrocities. These facts are largely ignored because the U.S. government is supporting them and that automatically means they aren’t a terrorist group according to the absurdly presented propaganda. 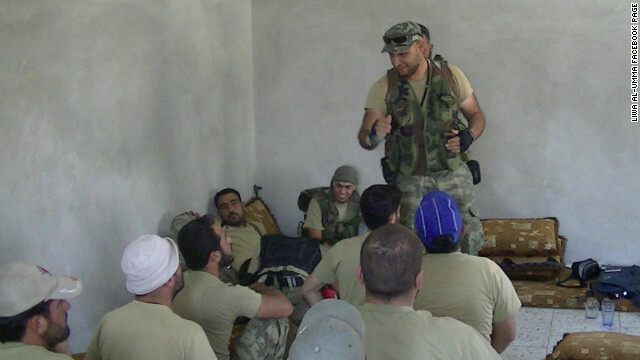 Here’s a series of reports detailing the war crimes committed by the Free Syrian Army. Even if for some reason you don’t believe that the Free Syrian Army is connected to Al-Qaeda, their track record of war crimes is well documented. The fact that McCain would visit with a group like this shows that he is a mentally ill terrorist sympathizer who should be put in prison or confined to a mental institution. After all, McCain has said that we need to be tough on terrorists so what better way to prove his own point than to use himself as an example. The leadership downplayed the announcement, however, saying that they have never really kept al-Qaeda ties a secret. Al-Qaeda certainly hasn’t kept it a secret either, loudly endorsing the group on a regular basis. The formalization of those ties complicates the Syrian rebellion, however, with secular factions getting ready to fight a secondary war with the Islamist blocs, which are getting stronger all the time. At this point there should be very little doubt that the United States government is preparing to wage war against its own people. Earlier this week, news broke about how the Obama regime through the Department of Justice is claiming in a memorandum that they have the power to use drone strikes to kill American citizens under the guise of the so-called war on terror. In fact, the memorandum claims through the use of vague language that they have the power to kill Americans even if they do not have any sort of actionable intelligence confirming that they pose a threat. It has been proven time and time again that the war on terror is a hoax used as a tool to justify endless war and draconian anti-freedom policies domestically. The official story of nearly every alleged terror event that has transpired in the 21st century has been torn apart and criticized by many independent researchers. Not to mention, Al-Qaeda the shadowy terror organization we are constantly told that wants to kill Americans, actually originated from within American intelligence circles. We have also seen the United States, Israel and other Western governments financing and supporting Al-Qaeda type entities. Western support of Al-Qaeda linked rebel groups in both Libya and Syria is well documented and shows what a big joke the war on terror is. It is no secret that the Department of Homeland Security was originally setup as a force to be used domestically against the American people. In the early 2000s, propaganda was used to sell the formation of this organization as a more effective way to protect the American people from Al-Qaeda. Over time this has been proven to be a complete and total lie considering all of their policies have been directed towards the American people instead of so-called foreign Al-Qaeda terrorists. They’ve left the border wide open, setup unconstitutional checkpoints at airports with naked body scanning devices and have even gone so far as to setup unlawful security checkpoints at bus stations, highways and train stations. In 2012 they purchased 1.6 billion rounds of ammunition and just recently ordered another 21.6 million rounds of ammunition to add to their stockpile. The amount of ammunition that they have ordered is enough to wage a war for many years. Since they are not a military organization and they are based domestically here in the United States, it doesn’t take a rocket scientist to figure out that the ammunition is being stored in case they need to use it against the American people. This is all happening at the same time Congress is attempting to shove through several gun control laws that would restrict the average American from purchasing firearms and ammunition. Since the Obama regime and the assorted control freaks in Congress are attempting to dismantle the second amendment on every front, it is entirely hypocritical to see them purchase such a large amount of ammunition. Going back to the DOJ drone memorandum, the White House Press Secretary Jay Carney actually referred to the policy as legal, ethical and wise. Essentially the Obama regime is claiming that it is lawful and ethical for them to exercise the power of judge, jury and executioner against an American citizen through a drone strike just because they say a person represents a threat. As mentioned previously, they are claiming that they don’t need to have any sort of concrete actionable intelligence. They are basically saying that they can just kill you just because they believe you represent a threat. This is the type of behavior that you would see from war criminals. In fact, numerous reports have confirmed that some of these Obama ordered drone strikes have actually killed innocent women in children proving that they are war criminals. Of course we never saw Obama or the corporate media attempt to humanize the death of the people they killed in these drone strikes in foreign countries. That’s because they’ll only humanize an event if it benefits their agenda. This is why Obama used the alleged Sandy Hook shooting incident and staged a public relations stunt with children when he signed his executive orders on gun control. Humanizing that event enabled them to push their ridiculous gun control program. Deputy National Security Advisor for Homeland Security and Counterterrorism John Brennan who is widely considered to be the architect of this disgusting drone strike program has been nominated by Obama to be the next Director of the Central Intelligence Agency. Apparently if you agree to participate and engage in war crimes you are elevated to positions of greater authority within the Obama regime. Let’s not forget that prior to the Obama regime coming into power; the Bush 43 regime implemented U.S. Northern Command which currently claims military authority over North America. This is an institution that would absolutely be unleashed against the American people in the case of mass civil strife. There has even been a bill proposed to implement FEMA camps under the guise of National Emergency Centers in Congress. This would actually help expand the number of government run facilities that are capable of being used to house large numbers of people. Essentially, we are talking about facilities that could be used as concentration camps. Although this particular bill has yet to be officially passed, it was actually just proposed again in the U.S. House of Representatives. So why is the federal government doing all of these things? The answer is actually very simple. It is no secret that the economy around the world is having severe problems. In the United States there are roughly 50 million people now on food stamps. Students graduating college find themselves in debt and can’t find a decent paying job. Inflation is running wild because of 0% interest rate policies and rampant monetization of debt from the Federal Reserve as well as out of control spending from the criminals in Washington DC. As a result, the cost of goods and services is going through the roof despite absurd claims that inflation is low. People are having an increasingly difficult time getting by and the American middle class is being systematically destroyed because of these policies. It is obvious that this economic system is unsustainable and when the day of reckoning comes, you are going to have millions of angry people out on the streets. Therefore, it is in the interest of the power structure to buy vast quantities of ammunition, set legal precedence for drone strikes against American citizens, expand the authority of the Department of Homeland Security and implement whatever gun control laws they can push through. As NATO desperately attempts to coverup a botched false flag operation in Benghazi, Libya which left a high ranking US diplomat dead, France has urged a repeat performance in Syria. That is, arming and providing air support for the very terrorist battalions now operating in Syria that have ravaged and overrun Libya, leaving it a perpetually wrecked, destabilized terrorist epicenter. Protection for “liberated” areas would require no-fly zones enforced by foreign aircraft, which could stop deadly air raids by Assad’s forces on populated areas. But there is little chance of securing a Security Council mandate for such action given the continuing opposition of veto-wielding members Russia and China. To answer Mr. Hollande’s question, one might look toward Libya where an identical campaign of violent subversion based on similar lies regarding the “protection of civilians,” was carried out by NATO and proxy terrorist organizations who were in fact listed by the UN itself as affiliates of the notorious global terror network Al Qaeda. The NATO-led, UN mandated evisceration of Libya put power into the hands of genocidal, racist terror battalions who literally scoured entire cities of their inhabitantseither massacring, imprisoning, or exiling them all beyond Libya’s borders. As international condemnation grew, recognizing that NATO, led by the US, UK, and France were essentially funding, arming, training, and handing an entire nation over to Al Qaeda affiliates, these terror battalions were directed to attack US diplomatic missions across the Arab World (and here). One attack in Benghazi, Libya, left the US consulate ablaze, unexpectedly trapping US Ambassador Christopher Stevens who succumbed to smoke inhalation. Despite the attacks, and the subsequent media circus and staged rallies to depict Libya’s client regime as “disbanding” terrorist militias, the fact remains that vast terrorist networks stretching from Libya to Syria are still fully armed, funded, and covertly backed by the very corporate-financier interests that sold the last decade of “War on Terror” to the West. In addition to a myriad of staged events to portray a divide between the West and its terrorist proxies, there are also sophomoric and desperate attempts throughout the corporate-media to rewrite the Syrian narrative as public awareness grows, and support for Western destabilization under the guise of “humanitarian causes” collapses. One such attempt was published in the Washington Post in a piece titled, “Among Assad’s opponents, moderation reigns,” where David Pollock of the Washington Institute for Near East Policy attempts to argue that Syria’s “opposition” is overwhelmingly moderate, with sectarian extremists being an exception to the rule, based on a poll conducted by the International Republication Institute. However, Pollock’s think-tank, the Washington Institute, is in fact a Wall Street pro-war think-tank, lined by notorious warmongering frauds and Neo-Cons including Richard Perle, Max Kampelman, US Ambassador to Israel Samuel Lewis, accused war criminal Henry Kissinger, George Shultz, and James Woolsey, all signatories of the now infamous Project for a New American Century (PNAC), and all signatories of numerous letters calling for war with both Libya and Syria. The International Republican Institute (IRI) is in fact funded by the US State Department and is chaired by Senator John McCain, who had shaken hands with the very terrorists responsible for the US consulate attack that left Ambassador Stevens dead in Benghazi, Libya. 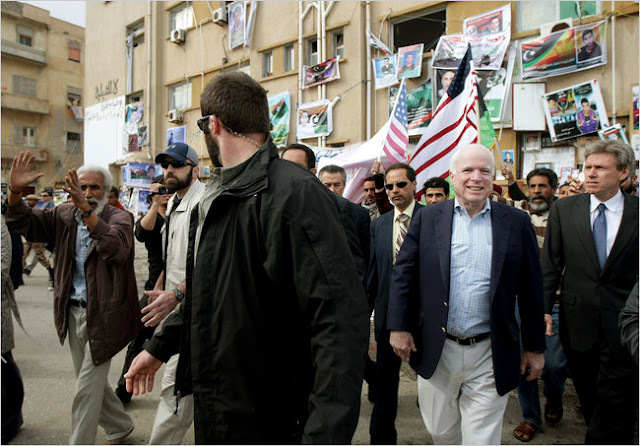 McCain has also traveled to the Turkish-Syrian border to provide these same terrorists with support. The IRI itself had played an instrumental role in engineeringthe allegedly “spontaneous” “Arab Spring,” training and organizing activists years before unrest took to the Arab World’s streets. Image: Senator John McCain (with the now deceased US Ambassador John Christopher Stevens on the right with blue tie) in the terrorist rat nest of Benghazi after marshaling cash, weapons, and political support for militants tied directly to Al Qaeda. McCain’s insistence that the terrorists he helped arm and install into power were “not Al Qaeda” runs contra to the US Army’s own reports which state that Benghazi’s terror brigades officially merged with Al Qaeda in 2007. McCain’s “Libyan patriots” have now killed US Ambassador Stevens with weapons most likely procured with cash and logistic networks set up by NATO last year, part of a supranational terror campaign that includes violently subverting Syria – a campaign McCain also supports. The idea is to maintain the narrative that the US is backing “freedom fighters” not terrorists, and it is an idea perpetuated by the very pro-war advocates behind the Libyan disaster and the Arab World unrest in the first place. We can expect calls for arming and defending terrorist proxies in Syria to continue while the corporate-media continues its attempt to portray what is literally Al Qaeda operating in Syria with NATO backing as instead, “pro-democracy” “freedom fighters” in desperate need of Western assistance. Conversely, we must continue to expose the corporate-financier narrative as the lies they are, while resolving to undermine the very source of their unwarranted influence which allows them to meddle globally in the first place. The US has sworn to “make pay” those responsible for the death of US Ambassador Christopher Stevens. In reality, those responsible for Stevens’ death are fully armed, funded, trained, and coordinating with NATO special forces in Libya, across North Africa, and in Syria. Image: Ambassador Stevens (right, wearing a blue tie) had been in Benghazi, Libya since March 2011. He played a leading role in coordinating the violent subversion of Libya by listed terrorist organizations before being named “US Ambassador” to Libya. Despite Libya’s capital being located over 400 miles west in Tripoli, Stevens was based out of Benghazi, the 30 year epicenter of terrorist extremism and Al Qaeda in Libya. Recent attacks on US embassies were designed to give “street credit” to sectarian extremists who are increasingly seen internationally as mercenary proxies of US-Saudi-Israeli foreign policy – Stevens’ death was most likely an accident. No one will “pay” beyond perhaps a wedding party attacked by US drones, or a limited liquidation of select terrorist groups the US created and armed during 2011’s violent overthrow of the Libyan government. Meanwhile, US warships and Marines will swarm around Libya simply to fulfill Western public expectations that “something” will be done. The embassy attacks were tacitly supported by the respective client-regimes recently installed by US political and military destabilization, and were designed to reestablish an adversarial narrative to counter growing public awareness of the US’ use of terrorist proxies, and specifically, Al Qaeda in nations like Libya, Syria, Iraq, and Iran. We are now expected to believe that Egypt’s new dictator Mohamed Morsi, and the terrorists of Libya whom the US is right now arming and supporting in Syria, are once again our implacable enemies. In all likelihood, those behind the attacks on the embassies intended the violence to be limited in scope, and without any high-profile deaths – designed simply to lend sorely lacking legitimacy to America’s growing list of client-states. Ambassador Stevens apparently was caught in smoke while escaping from the US consulate in Benghazi, and died of asphyxiation – a victim of unforeseen circumstances, not the victim of a targeted assassination. However, with a high ranking US diplomat dead in Libya, in Benghazi, the very den of Al Qaeda, leaves the United States and its foreign policy, especially in regards to Syria, in tatters. The Libyan Islamic Fighting Group (LIFG), along with its affiliates and predecessors, have been armed, trained, its leaders coddled and supported by the West for over 30 years. One of these predecessors, the US-CIA backed National Front for the Salvation of Libya (NFSL) made multiple attempts to assassinate Qaddafi and initiate armed rebellion throughout Libya during the 1980’s. Many of these fighters would also line the US-Saudi created front, Al Qaeda, when first it was conceived in the mountains of Afghanistan in the 1980’s. Most of these fighters lived and operated from Libya’s eastern region of Cyrenaica, and in particular, the cities of Benghazi and Darnah. It would seem unthinkable then that the US would pick what was the epicenter of terrorism in Libya to make contacts with militants who had carried out three decades of terrorism and had even fought directly with US troops across multiple theaters of war – especially after these terrorists officially announced their merger with Al Qaeda. But that is exactly what the United States did. Starting in March 2011, US President Barack Obama appointed Christopher Stevens as “Special Representative to the Libyan Transitional National Council,” and sent him to Benghazi to coordinate US military, diplomatic, and financial support to a “counter government” constituted from Cyrenaica’s Al Qaeda terror battalions and a cadre of US-educated, politically cultivated proxies across the “National Transitional Council” (NTC). Eventually, Stevens’ mission would become a success. NATO-backed terrorists overran the Libyan government, overthrowing it in Tripoli, brutalizing the cities of Bani Walid and Sirte – with the help of several months of aerial bombardment from NATO – and exterminating or exiling the entire population (10,000 to 30,000 people) of Tawarga. And almost immediately after the US’ success in Libya, the very terror brigades NATO had been funding, arming, training, and providing air support for, set out for the Turkish-Syrian border where they began invading Syria. Entire brigades fighting the Syrian government are led by Libyan LIFG terrorists and include within their ranks Saudi-inspired Wahhabi extremists – the ones who surrounded and attacked the US consulate in Benghazi, leading to the death of Ambassador Stevens. While we reflect on the 11th anniversary of the al Qaeda attacks on American soil, there is a blinding light that may obscure our view: this sworn enemy now fights hand in hand with the US against the Syrian regime. The historic State of the Union address by US president George W. Bush on September 20, 2001 is loaded with morals and principles about good and evil. The president’s ultimatum was clear: either you are with us, or you are with the terrorists. This week, head of the Salafi jihad and close ally of al Qaeda, Abu Sayyaf, pledged ”deadly attacks” against Syria as ”our fighters are coming to get you” because ”crimes” by the regime ”prompts us to jihad”. Bush referred to al Qaeda as the enemies of freedom: ”the terrorists’ directive commands them to kill Christians and Jews”. But Sheikh Muhammad al Zughbey proclaimed that ”your jihad against this infidel criminal and his people is a religious duty … Alawites are more infidel than the Jews and Christians”. Because the new jihad targets Alawites rather than Jews and Christians, does this render them better bed fellows? UPDATE August 12, 2012 – It was recently pointed out that the Libyan Islamic Fighting Group (LIFG) currently arming, funding, and commanding entire brigades of the so-called “Free Syrian Army” (FSA) is designated an Al Qaeda affiliate by the United Nations pursuant to resolutions 1267 (1999) and 1989 (2011), in addition to being listed by both the US State Department and the UK Home Office (page 5, .pdf) as a foreign terrorist organization and a proscribed terrorist organization respectively. This means that the United States, the UK, NATO, and the Gulf State despots of Saudi Arabia and Qatar are knowingly and willfully funding designated affiliates of Al Qaeda contrary not only to US and British anti-terror legislation, but contrary to UN resolutions as well. Western and Gulf State support of the FSA constitutes state sponsorship of terrorism. Should the UN fail to enforce its own resolutions, while playing host to further sanctions and considerations for military intervention against the Syrian government, it will have entirely resigned its legitimacy and authority as nothing more than a tool of Western corporate-financier interests. Image: Little else could accentuate the hypocrisy and unhinged madness of US and British foreign policy more than Foreign Secretary William Hague announcing his government’s decision to fund genocidal sectarian extremists murdering under the flag of Al Qaeda in Syria.